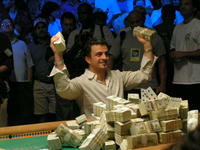 In the longest final table in the history of the World Series of Poker (WSOP) Main Event, 39-year-old Australian poker professional Joseph Hachem survived a record field of 5619 players to win the $10000 buy-in 2005 WSOP No Limit Texas Hold'em World Championship Main Event at Binion's Gambling Hall. The 9-player televised final table, which started at 4:48pm on Friday July 15, ended at 6:44am on Saturday July 16. The 2005 final table eclipsed the previous record set in 1983 by 18 minutes. A former chiropractor who quit his practice to become a poker professional three and a half years ago, Hachem (pronounced "HAH-shem") won the record $7.5 million first prize and the coveted white gold world championship bracelet after 7 days of play.